E-Zee Cut 1.5 oz. is a lightweight, Cut Away stabilizer. 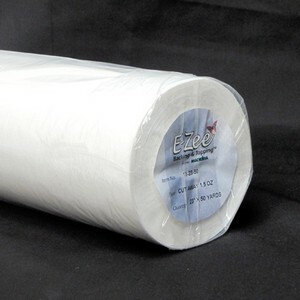 This high quality backing has a soft hand that is great for use with low stitch count designs. It is a backing that hoops well, helps to provide clarity in designs and will maintain its shape after repeated washing. Use with lightweight woven and stretchy fabrics. Cut Away backings should be used for knits and other unstable fabrics. Cut a piece from a roll or use a piece of pre-cut E-Zee Cut ® Hefty to fit your hoop size. Hoop by placing the backing underneath the garment.